Minister for Women, Children and Poverty Alleviation Mereseini Vuniwaqa takes a tour of the Nacula Village Women’s handicraft market in Yasawa on August 13, 2018. Thirty-three women of Na­votua, Naisisili, Malakati and Nacula received their skills training certificate from the Minister for Women, Children and Poverty Alleviation, Mereseini Vuniwaqa, yesterday. The recipients underwent a two-and-a-half day skills training course organised by the Ministry of Women, Children and Poverty Alleviation. Vuaki Village Women’s group team leader Iowana Qorowale said the women learned a lot from their course. “For some it was used to sharpen their skills, while others learned new things,” she said. Ms Qorowale said this was some­thing they always wanted and they thanked the Government for providing it for them. “Now to see all these creative arts on display is something to re­ally marvel at because taking up these courses really added to the natural skills they already have,” she said. “In a sense it helped them in tap­ping into new innovative methods, sort of enhances their creativity. Ms Qorowale said they empha­sised doing things by natural means. 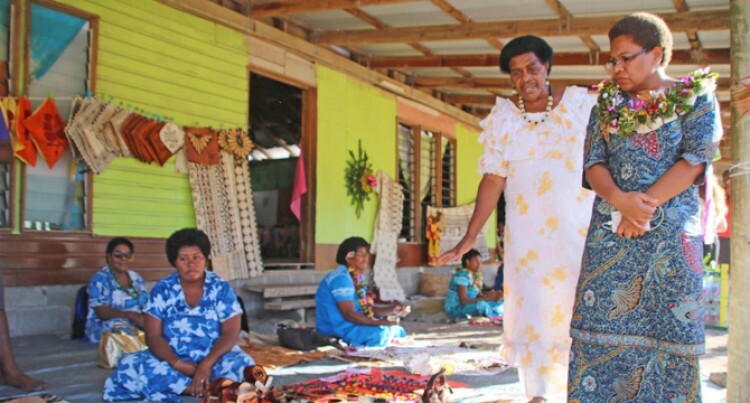 The women displayed their prod­ucts which Ms Vuniwaqa had a chance to view and marvel at dur­ing her tour of the Nacula Village Women’s handicraft market in Ya­sawa, on Monday.